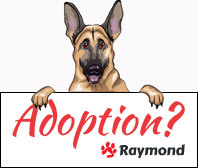 Hi everyone I’m Raymond the mascot for GSRE and here to help where I can. Just before you go ahead and fill in our adoption form just take a moment to double check you are ready to take on a lovely boy or girl like me. Long walks, wet paws, loads and loads of hair, vet bills, toilet mishaps, chewed things that may not be mine, fingers crossed I will live for many years and will need constant love and care for the whole of this time, on the plus side I do give out unconditional love and sloppy wet kisses on a never ending basis. If you are happy to partake in all the above for as long as I am with you then get typing and press send!!! You will initially be contacted by one of our screeners who will then arrange a volunteer to carry out a home check after having obtained a reference from your vet. If you live in rented premises, your application cannot be processed until the screener has sight of permission from your landlord to have a dog/s at the premises. Once the home check has been completed the report will be sent to a Coordinator who will contact you to discuss dogs. No information can be given out on individual dogs before this time. Initial contact may be by email so please ensure you check your email regularly including your spam folder. If a meet is arranged with a dog still currently in their home, your home check will be sent to the volunteer who assessed the dog to arrange a meet. You will be expected to travel to the location of the dog you wish to meet. Adoption donations depend on the age of the dog and can range from £100 to £300. Please provide us with contact phone numbers so we can easily get in touch. Who else lives at the property? How would you get the dog to the vets?